This collection of seven bedtimes stories is set in the Land of Wordishure, where His Word is sure. Each story begins with a Bible verse that gives the reader the real meaning or moral of the story. The first six stories chronicle the adventures of all sorts of fun characters such as Brimnibble the hat-eating dragon, Argyle the sock weasel, and Turner the chameleon. The final story brings all the characters from the first six together for one big adventure. The book is a good read-aloud for the younger children, a great reader for the older kids, and has even been enjoyed by many adults. Tales of Wordishure is a great book for learning about the joys of serving Jesus Christ. It is written in a classical style, like Beatrix Potter or Hans Christian Andersen. It will surely become a classic in your home too. 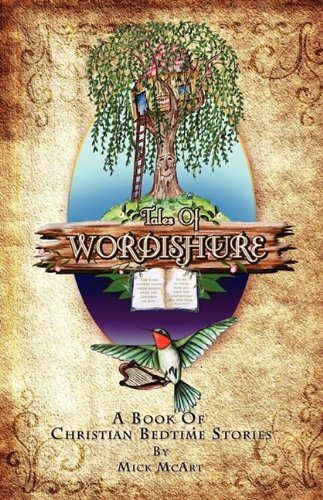 To purchase Tales of Wordishure, go to www.wordishure.com.